Many people spend a lot of time in the kitchen, especially if you’re busy entertaining or have a lot of people coming to visit; as many of us who live in Florida do. So we’re using a lot of water in our kitchens. The only other room which uses more water in most homes is the bathroom. Aside from cutting down on water use, here are some water saving tips in the kitchen which can in turn help the environment, and save on your utility bill in the process! If your kitchen faucet is leaking, don’t ignore it. Often time’s leaky faucets are ignored simply because they’re in the kitchen and they aren’t bothering anyone, where if they were in the bathroom, you’d hear that annoying drip all night long. The water wasted from leaking faucets can add up, so don’t delay and call a professional plumber and get that fixed quickly. Living in Florida definitely has its benefits. But when you turn on a faucet, rather than waiting for hot water, we wait for cold water. That’s wasting precious water. A simple fix for that is by storing water in your refrigerator, having a refrigerator which has a water dispenser, or by having a water treatment system installed. 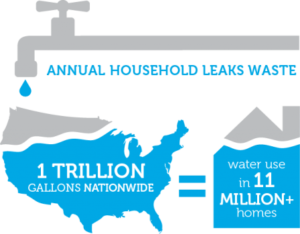 WaterSense faucets can be installed on your existing faucet. They are about 30 percent more efficient than your standard faucet, and they still provide sufficient flow. They can save 700 gallons of water per year! Despite popular belief, running a dishwasher uses less water than hand washing dishes, providing the dishwasher is running on a full load. Not only will you save money, but you’ll save time when using a dishwasher. ENERGY STAR certified dishwashers cost only about $35 per year to run while saving 3,870 gallons of water on average over its lifetime! Don’t let that annoying drip or high water bill ruin your day, give Wyman Plumbing a call today!